Wat Borom Racha Kanchana Phisek Anusorn, or Wat Leng Noei Yi 2, serves as a key spiritual centre for especially Thai-Chinese worshippers along with Thais and tourists on every auspicious occasion like Chinese New Year. 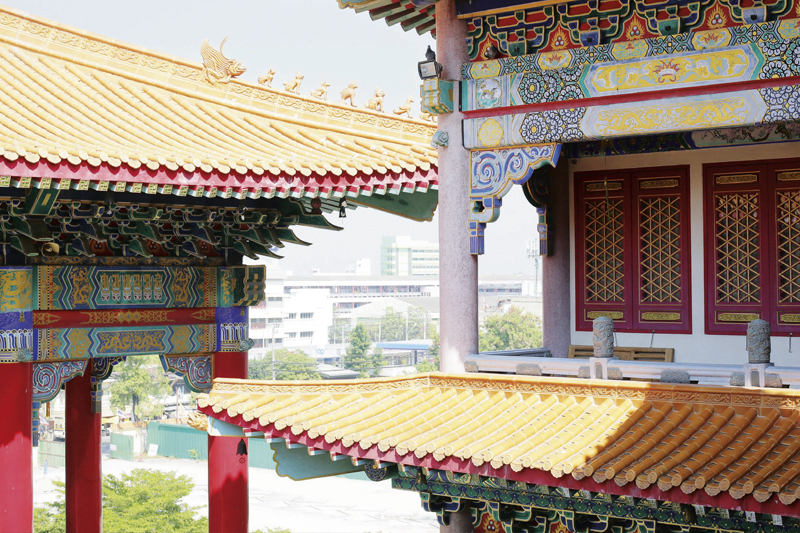 The temple complex is known for its opulent art and architecture that pays tribute to Chinese Buddhist Art. Its official name is Wat Borom Racha Kanchana Phisek Anusorn, Chinese Monk Clergy, Rungsan Sect. 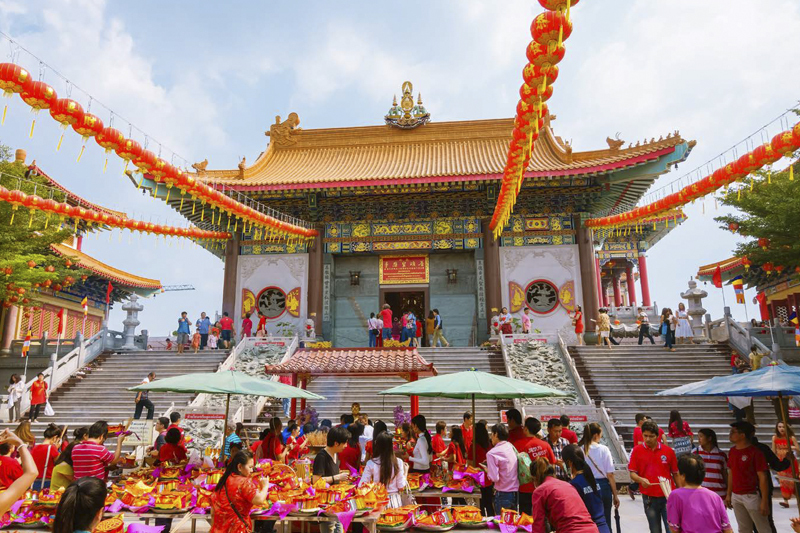 The massive temple began life as a Chinese vegetarian cafeteria in Nonthaburi’s Bang Bua Thong district. Over time, the cafeteria was redeveloped as a temple of the Chinese Mahayana school of Buddhism on a 14-rai tract of land. Construction work, which lasted 12 years, required the labour of skilled Chinese craftmen and construction materials brought over from China such as stone and carvings. 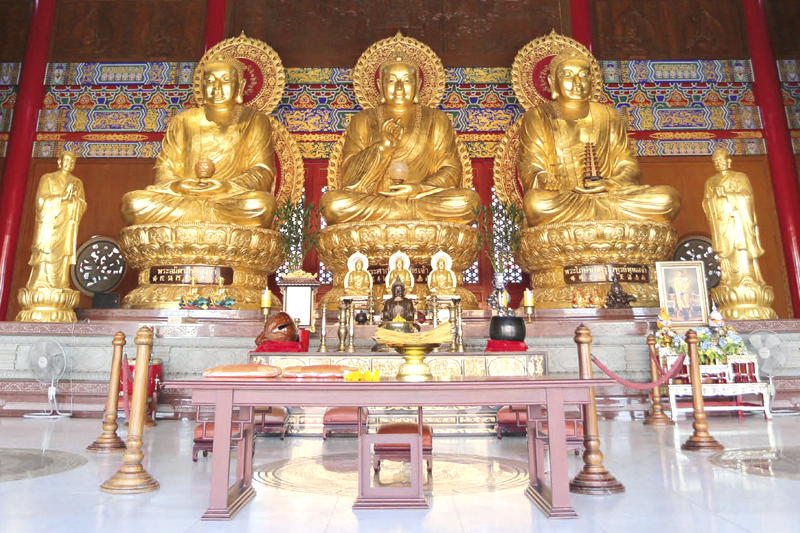 Founded to celebrate King Bhumibol Adulyadej’s (Rama IX) golden jubilee, the temple acts as the spiritual centre for Thai-Chinese Buddhist scripture school. 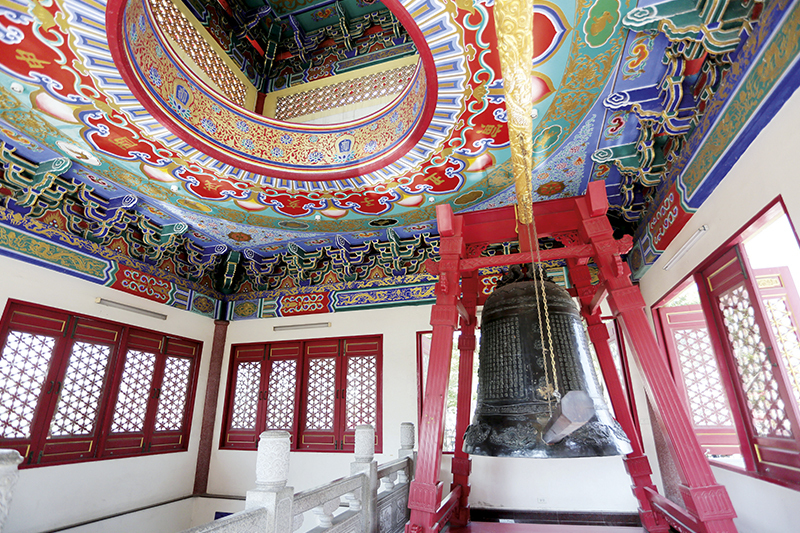 The largest Chinese temple in the kingdom and inspired by the Forbidden City in Beijing, Wat Borom Racha Kanchana Phisek Anusorn displays the majestic Ming- and Qing-Dynasty architecture of central China with a colour scheme of blue, green, red and gold. The Buddhist mantra of “om mani padme hum”, written in gold Tibetan characters, adorns the walls and ceiling and is believed to protect oneself against evil spirits. 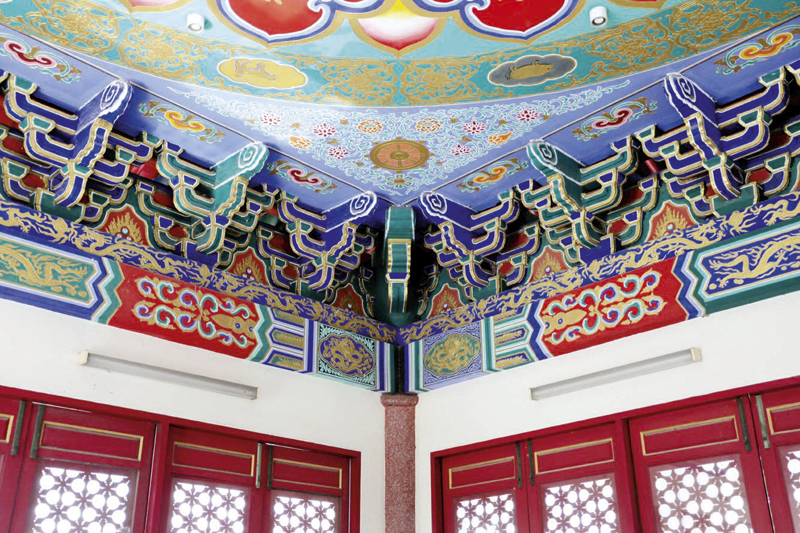 All corners of the roofs are decorated with carvings of auspicious mythical creatures such as the dragon, swan and goat. The path from the main gate leads upwards to the raised open space that’s reserved for worship of heaven and earth. 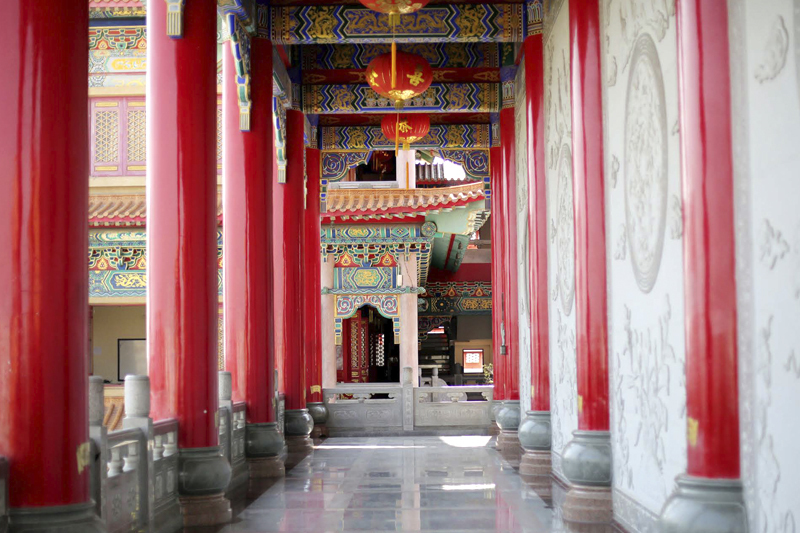 On the 2nd level is the hall of the Four Heavenly Kings flanked by a bell tower on one side and a drum tower on the other. The 3rd level hosts the principal Buddha image hall with the lettering on its sign rendered in the style of Bangkok’s Wat Mangkorn Kamalawat. Standing behind it on the same level is the 2-storey Avalokiteshvara hall that houses Guanyin with 1,000 arms and 1,000 eyes. The deity is flanked by a smaller Guanyin image with a crown on the head and another in the position of fulfilling worshippers’ wishes. 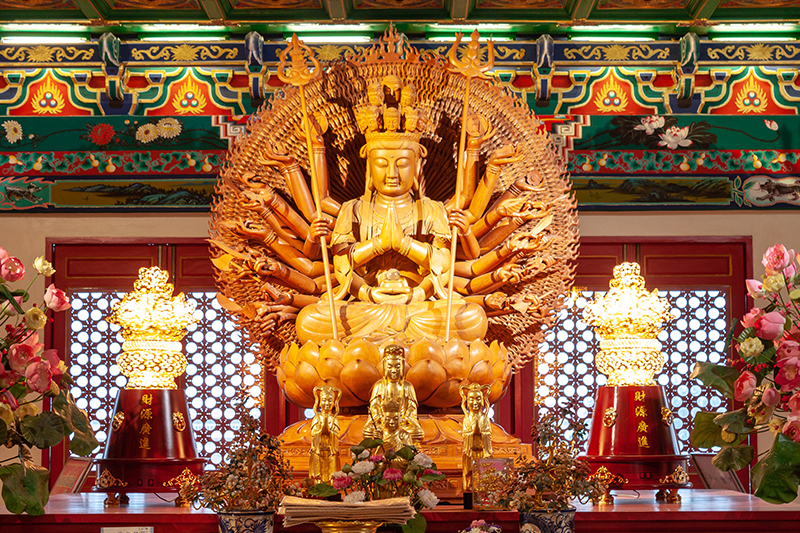 Next to the Avalokiteshvara hall is the Sukhavati hall that features Amitabha, Avalokiteshvara and Mahasthamaprapta, surrounded by 10,000 Buddha images. 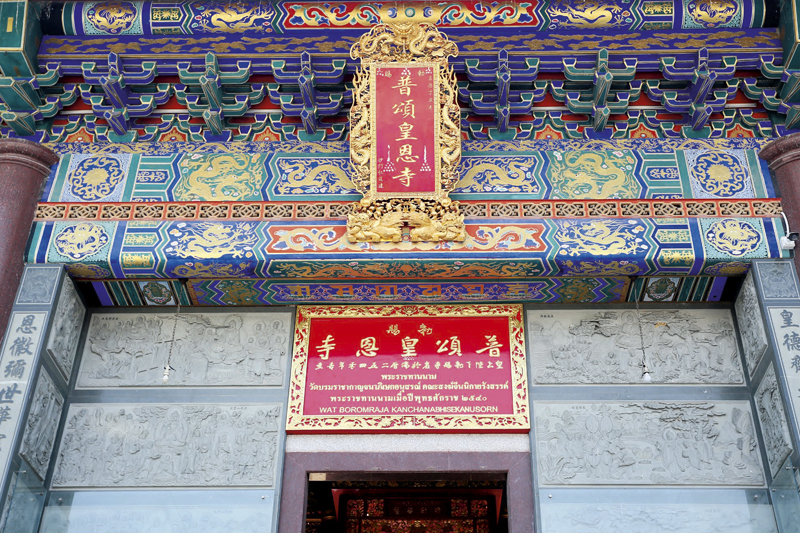 These halls represent the Pure Land branch of Mahayana Buddhism that is full of happiness and free from misery. With opulent Chinese Buddhist art, Wat Borom Racha Kanchana Phisek Anusorn is a beautiful, sacred haven of peace and serenity. Wat Borom Racha Kanchana Phisek Anusorn is at 959 Moo 4, Thesaban 9 Road, Sanoi Loi, Bang Bua Thong, Nonthaburi, 11110. Call 0 2571 1155 FB: facebook.com/Wat.Boromracha.Temple.